9/16" long x 5/16" wide. Transparent beads with colored centers. Colors: light blue, light red, green, light orange. Multi-colored, various shaped venetian type glass trade beads. For necklaces, charms, etc. Specifiy colors desired. Give second choices on colors and styles. 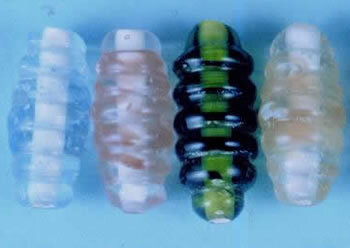 These hand made beads vary in size and shape and no two are exactly alike. All beads are picked as they run and no selecting or matching is attempted. Specify style and colors desired. Give second and third choices as these beads are not always available. These beads have holes that are usually about 1/8" in diameter but they vary as much as from 1/16" to 3/16" in hole diameters.